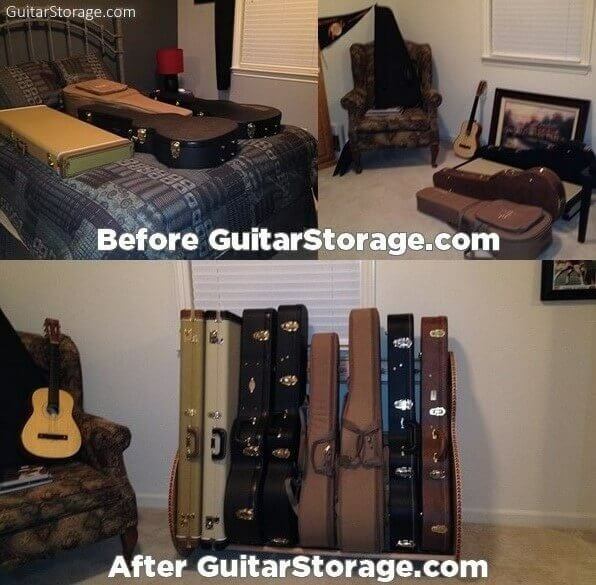 Are your guitar cases and gig bags making a mess of your home, your music studio or your closets? 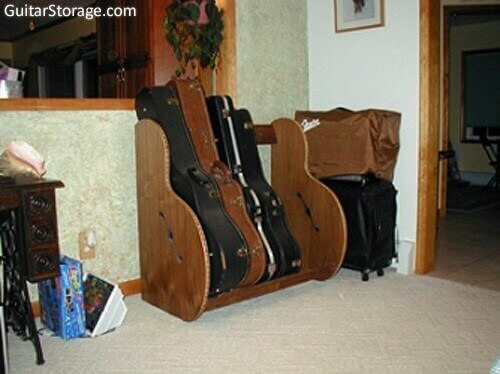 Behold the Studio™ Deluxe guitar case racks: the finest storage solution for your prized instruments. It’s made by skilled AMERICAN craftsmen who are passionate about building you an exceptional product. The Studio™ Deluxe features imported herringbone inlaid edging and is available in Walnut Finish or Red Oak. Our 'Special Edition' features stunning Sapele Mahogany sides with Red Oak rails for a beautiful contrast in finishes. 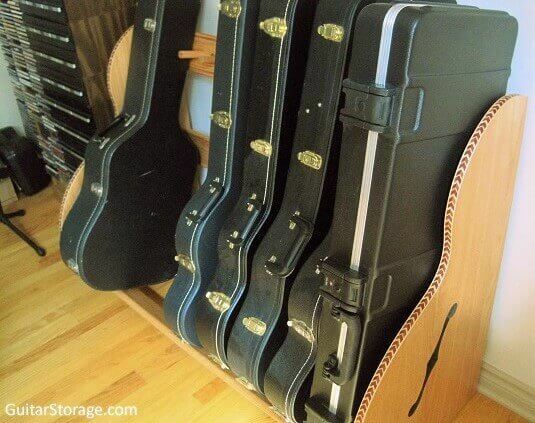 Adjustable hardwood dowel separators enable you to stand all different sizes and shapes of guitar cases. And all you need for easy assembly is just a Phillips-Head screwdriver. Additionally, if you'd like to be able to easily move the rack around the room, we now offer an optional wheel kit add-on (drill required for assembly). 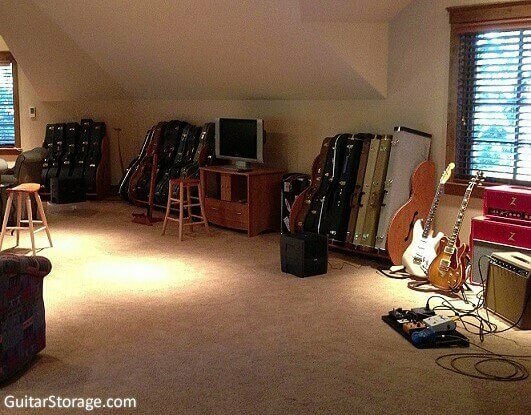 Consolidate your collection, save space, and get a nice piece of furniture too! And if you’re searching for a great gift this Valentine’s Day / Father's Day / Christmas / Anniversary / etc., you’ll be sure to knock it out of the park this year with the Studio™ Deluxe. A: The side pieces are made of real wood veneer over an MDF wood core, with herringbone inlay along the edges. The 4 support rails are solid hardwood. "This saved my marriage! "“This saved my marriage!! 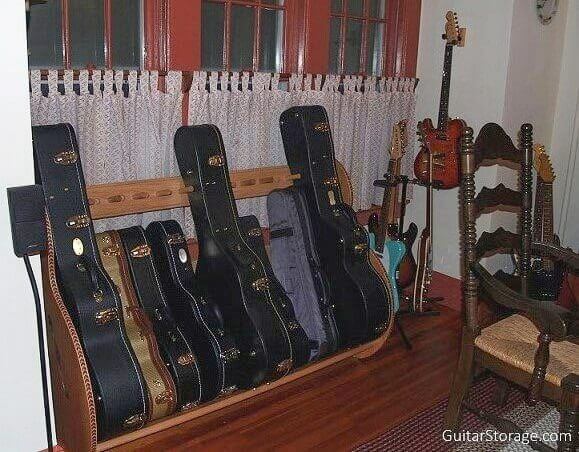 It finally gave me a place to store my guitars in a minimum space. My wife loves you guys! !” - Richard A. "one heck of a product"“you have engineered one heck of a product. I liked the first stand i bought but when i installed the wheel kit, i was blown away with how well the product and the instructions worked. I haven't assembled anything that was "some assembly required" that went as well as this. thank you!” - Kyle C.
"prompt and friendly assistance"“Thanks for your prompt and friendly assistance with this. 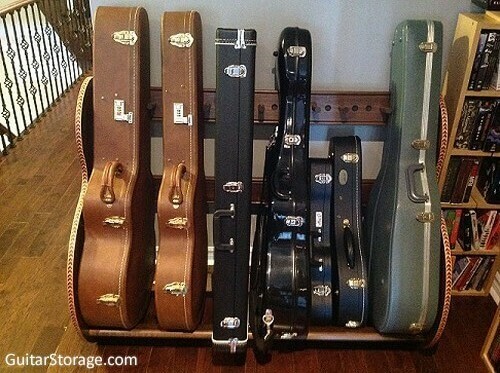 Its my husband’s birthday soon and I do not know who is going to be happier – him for the unique rack or me for the tidy garage!” - Jodhi R.
"very organized"“We love the rack which was very easy to put together... now our cases are sitting in the in the rack very organized... sadly they do hide the beauty of the craftsmanship.” - Lauren R.
"definitely worth it"“I've just received the rack yesterday. The waiting was definitely worth it. 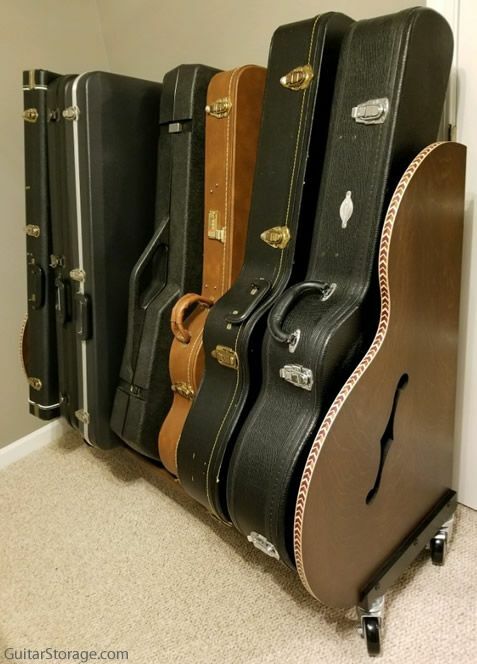 I‘m very happy with my new guitar storage. Now there are no limits to expand my collection ;-).” - Philipp H.